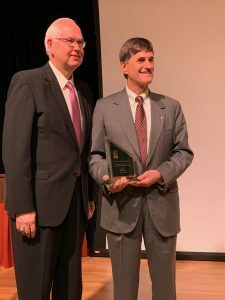 Cleveland, TN—Lee University President Dr. Paul Conn received the 2019 Robert Varnell Leadership Award during the Cleveland/Bradley Chamber of Commerce annual banquet. Conn, who has been president of Lee University since 1986, received the recognition at the January 31 gathering of over 400 community business and organization leaders. He was honored based upon his demonstration of the qualities of the award including, “leadership in the professional, religious, and civic endeavors” as modeled by the award’s namesake, Robert Varnell, Jr. Honorees are chosen by a committee of previous winners and nominations from the community. Lee University President Dr. Paul Conn, right, accepts the 2019 Robert Varnell Leadership Award from Art Rhodes, 2018 recipient. In 2001, Conn was the recipient of the other major award presented by the Chamber each year. The M.C. Headrick Free Enterprise Award was established in 1981 and recognizes individuals for “preserving the free enterprise system,” and demonstrating the traits of the late business leader M.C. Headrick, including “integrity of character, generosity and compassion toward others, good citizenship, originality and ingenuity, earnest and hardworking ability and a desire to see others achieve the best in their lives.” Conn is one of only three individuals to receive both awards. Presenting the award was the 2018 recipient of the award, Art Rhodes, president and CEO of the Church of God Benefits Board. Rhodes extolled the accomplishments of Conn in his 33 years leading the Church of God’s premier educational institution. Nominators touted the “renaissance” Conn has led of Lee University in growing enrollment, expanding the campus, and improving the quality of life for citizens of Cleveland and Bradley County. Conn is the 25th recipient of the Varnell Award which was established in 1994.